A multimeter is an indispensable tool to have at home and at work. It is capable of measuring current, voltage, resistance, and electrical connection. A multimeter is used to perform accurate readings on electrical circuits and devices. Simple electrical repairs can be made with the help of the right multimeter. It could save a lot of time and money if quick fixes can be done without needing to call a professional. Designers and hobbyists can also use best multimeters to test design ideas or new products. The type of multimeter to be bought highly depends on the purpose for its use and the person who is going to use it. Professionals are usually better off with pricier multimeters that may prove to be too complicated for non-professionals or inexperienced users. It is important to strike a balance between functionality and price, especially for those still learning their way around multimeters. Some multimeters even emit audible tones that warn novices if the input jacks are set wrong. The most common types of multimeters are analog and digital. Analog show real-time current and voltage readings, but can initially be difficult to use and would require some practice. Digital, on the other hand, are easier to read but could give less accurate values when the current fluctuates. Other types of multimeters include manual ranging which allows the user to set a range, and auto ranging where the measurement range is automatically detected by the device. As a safety issue, it is advisable to get the best multimeter that has different ports for voltage and current measurements, whichever type is chosen. Also, the maximum current and voltage ratings have to be checked to ensure that the multimeter is capable of handling the job it is going to be used for. Other factors to consider when choosing a multimeter are functionality, calibration, build quality, and accuracy. Multimeters with a lot of measurement functions are typically more expensive, so it would be better to determine from the start which specific functions are desired. Calibration affects accuracy in such a way that if the multimeter cannot be regularly calibrated, then accuracy cannot be guaranteed. So, if accuracy is important, an uncalibrated multimeter is out of the picture. High-quality multimeters generally have better build quality. Jobs requiring a durable multimeter naturally require purchasing ones that can withstand rougher conditions than those meant for home use. It is always safer to buy the best multimeter that would be able to handle the demands of the job they are going to be used for. Lastly, accuracy helps in determining if a circuit is working well, but is not really required for verifying if a circuit is working or not. It is alright to choose a less accurate multimeter if accuracy won’t be a big deal in the job it will be used for. Here is a list of some multimeters that are commonly used today by professionals and non-professionals alike. 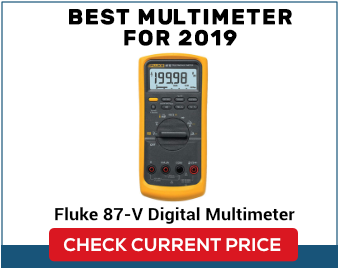 The Fluke 87-V has consistently been getting top spots in picks for the best multimeters in the market today. This comes as no surprise as Fluke is known for producing some of the best multimeters to date. Quality comes with a price, and the Fluke 87-V certainly doesn’t come cheap. That price tag is justifiable though, because Fluke 87-V consistently provide accurate readings, and offers the option of switching off the auto ranging system. This device has the ability to create an analog bar to follow quickly-changing signals, making it unnecessary to buy an analog multimeter. The Fluke 87-V emits a beep if the input jacks are set incorrectly, effectively warning inexperienced users about their mistake. Another great feature is the ability of this multimeter to measure up to 20A every 30 seconds. Affordable yet dependable, the Extech EX330 is the best multimeter that can be purchased for around $50. Despite its price, Extech did not scrimp on features, and even offers more than what other more expensive multimeters do. Aside from being able to test voltage, resistance, frequency, current, diode, duty cycle, and continuity, EX330 offers a tilt stand, auto-ranging, continutity tester, and the option to set the data readout to relative, data hold, or hold. On top of the already numerous features Extech EX330 offers, there is even the extra bonus of being able to detect temperature. Two AAA batteries are needed to operate the device. The Fluke 88 V/A does an exceptional job of diagnosing the health of a car’s injector and determining the signal pulse width. It also has a rugged build and an impressive maximum resistance of 50M, 1000V DC and AC, and can even take dangerous spikes reaching 8000V. Performing diode tests on vehicles are not a problem with this multimeter. Accuracy is set at +/1 1%, making it superbly accurate. The maximum conductance that it can measure is 60.00nS. On top of all these, Fluke 88 V/A even offers a lifetime warranty. Mastech is another quality multimeter brand, and their Mastech MS8268 is worth so much more than what one has to pay for. A favorite among non-electricians, it is durable and ideal even for novice users. It also classifies as a multi tester since it is manual and auto range in one. The LCD display on the MS8268 is large, making it easy to read backlit measurements in the dark. It can auto power off to save batteries, has 1000V AC/DC, is auto ranging, has a diode checker, and comes with a 1 year warranty. In addition to basic multimeter functions, the MS8268 has a transistor gain checker, and capacitance and frequency input. Aside from being more than capable of doing basic multimeter functions, the Klein MM500 holds the promise of being able to withstand real world environments. This auto ranging multimeter will be able to survive being dropped from up to 10ft onto concrete, and is also waterproof and dustproof. The dependability of the MM500 is perfect for those who need it on the job site. This multimeter is pretty simple to use in tasks like basic repair and troubleshooting on household appliances. It has a CAT IV rating and resistance rating of 4000Ω. The MM500 may not be as cheap as others with the same functionality, but its toughness and durability certainly saves money in the long run. The Fluke 116 was built for HVAC professionals. It is a full range multimeter than is more powerful than it looks, and is capable of handling basic HVAC situations. Readings are made easier with the option to switch to manual range mode if auto ranging isn’t preferred. It also has flame sensor faults and built-in thermometer with a modest range. The Auto-V LoZ feature of Fluke 116 is very convenient to have because it distinguishes DC from AC voltage without needing to manually switch between each other. A lower input impedance also screens out ghost voltages from other circuits that could affect readings. Although the Fluke 116 had HVAC professionals in mind, it would still be a good standby multimeter for the general electrician. Even though digital multimeters dominate the market today, analog multimeters are not exactly rendered obsolete. Simpson analog multimeters are still in demand today, owing to their dependability in readings and calibration. Digital multimeters are more precise and more convenient to use, but analog multimeters are better at getting a range of readings, and at giving accurate readings when the current fluctuates. The Simpson 260-8 measures voltage, ohms, and milliamperes on different scales on the device. A mirror is fitted onto the dial, reducing parallax and ensuring accuracy of the measurement. The Simpson 260-8 is great as a general-purpose multimeter and has an accuracy comparable, or even better, with others in the market. Made for the more experienced professionals, this multimeter can be switched between auto ranging and manual if the need calls for it. It is suitable for use in commercial environments like schools and hospitals. The Fluke 117 has a nice LED screen, and a design that makes it very comfortable to hold even for women. It uses a true RMS for taking accurate measurements of non-linear loads, and is capable of measuring frequency, capacitance, voltages, and electric currents. The Innova 3320 multimeter serves as a general-purpose device ideal for home electronics and automotive. It is takes readings accurately and has an auto-ranging scale that sets the correct range in determining measurements. The big LCD screen makes it easy to take readings and rubber coverings protect the corners when dropped. With the Innova 3320, various measurements can be taken including current, AC/DC voltage, resistance, audible continuity, and has a diode checking function. The Innova 3320 has a unique feature—having a battery load tester. It can tell the status of the battery, or if still working or not. The display indicates the status of the battery with LEDs lighting red, orange, or green.